Superbly located directly opposite Colley Reserve and Glenelg Beach! This beautifully appointed, spacious, two bedroom & two bathroom, fully self-contained apartment offers a modernised interior and a range of features to ensure a relaxed and comfortable stay for the most discerning traveller. Unwind and enjoy the spectacular ocean views, picturesque park views and glimpses of the Marina from the dining, lounge and kitchen areas. Or perhaps head for a swim or take a leisurely walk along the beach or just sit and admire the stunning sunsets. The choice is yours! Indulge and take time out to relax in the warmth of the deluxe 2-person spa bath or watch a movie on the plasma TV. Experience the luxury of gorgeous ocean & park views whilst either cooking up a treat in the kitchen or dining at the table. Oceanview Apartment is walking distance to Glenelg Beach, the famous cosmopolitan Jetty Road 7-day shopping precinct, cafes and restaurants, Holdfast Shores Marina, the Beachouse fun park, Bay Discovery Centre, galleries, antique stores, local library, play-ground, the Stamford Grand Hotel, and trams which run between Glenelg & the city of Adelaide. 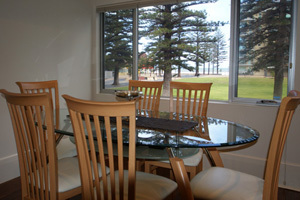 A perfect convenient location, in the heart of the popular beachside suburb named Glenelg, Adelaide’s “Seaside City”. Close to the International Adelaide Airport, Harbour Town Outlet Shopping Precinct, CBD, Golf courses, the Southern Winery Tourism region and other South Australian major attractions. Master bedroom with Queen-size bed. 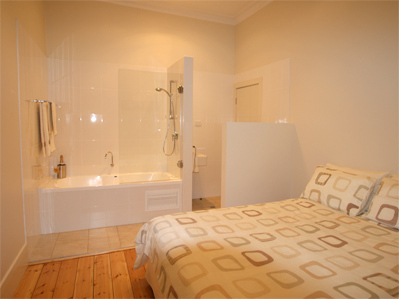 Plus open plan ensuite bathroom with deluxe 2-person spa bath and adjustable shower rail, vanity & toilet. Second bedroom with queen-size bed and single bed. Our aim is to listen to your personal accommodation requirements and tailor a package/rate to suit you. Rates are based upon: length of stay, season, number of persons and servicing requirements. Cancellations made due to unforseen reasons, may have the option for us to hold all monies in credit against a future booking to be taken within a time frame that is mutually agreed upon by both parties. If the future booking is not taken within the agreed time then all monies paid will be forfeited.